Hopping out of the drivers seat of the wine-wagon and into the fire. Time to take a dive into one of most the hotly debated subjects around the wine-cooler these days, the topic of wine scores or points. Nothing in the wine world kicks up more dust among normally very civil and easy-going cork-dorks than a conversation about points and wine scores. This subject really gets a lot folks to pop their corks, depending on which side of the argument you fall into. Many winemakers and winery owners are flat out against points [scores] and vehemently so. This is not to say that I'm not sympathetic to their point of view, because I am. But they are in a small yet vociferous minority, that really has no chance of turning the Titanic around. This same group makes no bones about it and will even tell a group of bloggers about their animus towards points and or even medals. I think the gentlemen that spoke to our group last summer on Red Mountain was unhappy [miffed even] that I reviewed his wine, gave it a good score, made a purchase of said wine and had it shipped home [god, the nerve I have]. Many of my fellow wine-bloggers and wine-enthusiast friends are in the anti-points camp [the cool-kids club] and perhaps will be very unhappy that I voiced an opinion which contradicts [bummer] their point of view on the issue of wine supposedly being subjective or the fact that points being neither bad nor good and are here to stay. This blog is no stranger to controversy, as this blog is also a proponent of "natural" cork for "age-worthy [mostly red] wine and screw-caps for early quaffers. But I will save the conversation for another day, folks may already hot under-the-collar [I can hear the collective boos and hisses] about the subject at hand. If you find you're one of those folks who believe that wine like art is subjective, stick around there is plenty to discuss and think about on this multi-layered topic. Point Shoppers: Honestly do you think the 100 point scale is going away anytime soon? Umm, I don't think so and there's no trend indicating that is going to happen. In fact the trend is quite the opposite and points on wine are becoming the everyday equivalent of a buy-me-now sign, fastened to case stacks across the country. It's time to face the facts folks, many wine-consumers are point shoppers, collectively as a people Americans rate everything from cars to coffee, most of those scores are close to the mark. For many though the crux of the issue in the point-game is what lies behind the scores. That of course is money, it's all about the money and it always will be, remember what Cuba Gooding Jr said in the movie Jerry Maguire, "show me the money!!" and in another interesting quote from the movie he says, "We live in a cynical world. A cynical world and we work in a business of tough competitors." So go big or go home is the take away here, the average wine-shopper has been conditioned to live or die by points. The average wine-swirling, sipping and slurping consumer doesn't want to be bothered with thinking about the wine they are drinking. The average wine-shopper today just wants it quick and easy, no fuss, no muss like microwave popcorn. Just take a look around your average wine and spirits shop, you will see point signs everywhere [like red flag warnings on the beach] and on everything that has been reviewed. The retailers want these types of wine in their inventory and consumers want these types of wine in their glasses. Is this wrong or bad perhaps, but this where the conversation veers into subjective-ville. Points Forever: For all you folks that despise points and think they are detrimental to the wine industry [which in some ways it may be] sorry but even one of giants of your cause, Mr. Hodgson freely admitted to WSJ reporter, that despite my studies [exposing discrepancies in the 100 point scale], he is still betting that, like the French, American consumers won't be easily converted to the idea that wine experts are fallible." 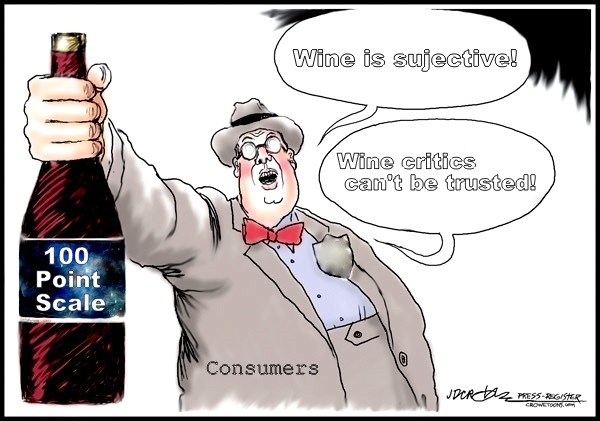 And Mr. Joshua Greene, editor and publisher of Wine and Spirits, told WSJ reporter Mr. Mlodinow, "Even though ratings of individual wines are meaning less, people think they are useful." So you can clamor and make all the noise you want to about how unfair it's, that wine is subjective and that points don't matter, but apparently they do to the great unwashed masses. Cherry Pickers: Here in the states we are a nation of cherry pickers, look at what I-Tunes has done to the music business. Folks want and seek out what is popular and will leave the rest in the dust. Whether this is bad or good is irrelevant. This is not a trend that is going to change, it will only deepen and become more common. Phone Shoppers: This category of wine-shopper is the new emerging trend and you wine retailers and wineries better get out in front of this as much as possible, because phone shopper are point shoppers. Folks are scanning your bar-codes looking for descriptions, prices and points. I see these folks increasingly more and more, shopping with their phones and making a buying decision based on what they read on their screens. You may just wanna start incorporating those QR codes into your labels. I've got one on my blogs sidebar, time to get with it and stay up with new trends or get left behind. Today's tech-savvy shopper is really demanding more from their shopping experiences and are taking the Internet [a powerful point shopping tool] with them as they shop. So sorry to say like size, points do matter. Know your Reviewer: This is good advice for anyone, consider the source of your information before you make a buying decision. Most of the time a RP high score will mean, that you are getting a wine that is more fruit forward or bit-overoaked in the Chardonnay department, generating that fat mouthfeel. While a WS score will often offer a wine that is more rustic and austere, even though the score is high [see example below]. Since points are not going away, you may want to get to know your reviewers point of view on wine much better. That way you reduce the risk of getting a dud. Whether those reviewers work for a major publication or write a blog like this one. Double Edged Sword: For the wineries and retailers who readily embrace the 100 point scale, sometimes a score can be your best friend or your worst enemy. "A wine can be broken, made, and, then broken again with only a two or three digit number. It is an addiction that needs to be feed. Get the points, get the review, and get the adoration. "~ Taylor Cram. It can be a vicious cycle of great scores, swamping you with more business than you can handle one year and mediocre to near flat-lining the next. A score of 89, which by itself is a still a good score, but to many it's the kiss of death. As a consumer who counts on points, they can burn you if you don't completely read the tasting note attached to the score sheet and understand to POV of the reviewer. Other Voices: This topic is hot, hot, hot right now, so if want to read the thoughts of Blake Gray, a self-described "Seminar Bad Guy" who reportedly is Running with the Devil: Supporting the 100 Point Scale. Check out his take on the issue, another refreshing contrarian view point on the subject, sure to ruffle a few more feathers. As he's takes on each and every argument against the 100 point scales and as he says, "squashes them like bugs". All that Glitters is Not Gold: I've learned this lesson on more than one occasion myself, just because a wine has a high-score does not always mean you are going to like it. This is why it's so important to also read the tasting note attached to that score. See this is where many folks will think oh-Mr. Cuvee, you have contradicted yourself. Hey, not so fast, because what I find in my own wine-shopping experiences is that the score on the printed sheet is for different vintage year than what is printed on the Wine-Speculator endorsement sign. This is something I began looking at much more closely, relatively quickly after I started drinking wine some eight years ago. Here's another example, the 2008 Tenuta Sette Ponti "Crognolo" that was given 92 points WS and had this to say in the tasting note "Very silky and fine, with currant and berry on the nose and palate. Full-bodied, with a wonderful mouth-feel. Clean, fresh and direct and best after 2011. The thing I missed in the tasting note was this, direct and best after 2011, when it should have said best after 2016. Sometimes the reviewer just gets it wrong, because this wine is a very-dry, tannic beast, that will need plenty of time to lay-down in the cellar, not a wine for early quaffing. Point Manipulation: This issue is one that is a big bugaboos among many wine-insiders. The claim is this, that many folks trafficking in the production of high-end Pinot Noir all over the New World are spiking their juice with Syrah or some other varietal, without that fact being disclosed on the label. Then the comparison to OW pinot is made and it's an unfair comparison because OW Red Burgundy legally does not have any room to add anything other than 100% Pinot Noir. As I've noted before, many wine-consumers frankly don't care too much about this issue and just want to get their pinot fix. International Style: Then you have the argument within the same context of point manipulation and that is the international style. Many accuse these wines of being manipulated to one garner praise from their willing accomplices in the wine-media and two produce a wines in an approachable style that tend to be full, rich, jammy, silky. The argument against this trend goes something like this; "By drinking commercially acceptable, commercial-tasting cabernet-merlot-chardonnay, wine drinkers will gain little insight into traditional styles." and those styles will eventually disappear forever [sigh]. ~ Beek Man Wine While that's a possibility, I've seen the alternative where many wineries that make big money on the so-called International Style, plant small amount of the obscure grape varieties. So sorry folks, I don't subscribe to the notion that giving wines a score is necessarily bad. Scores and points are just tool and just because some folks misuse this tool, it doesn't mean we completely have to get rid of the 100 point scale. I welcome your thoughts and impressions, good bad or indifferent. Until next time sip long and prosper, cheers! I'm in the "anti-points" camp,that instead of the point-scale being used as a tool, it's being wielded as a weapon.